Marketers tend to personally consider themselves as early adopters or in the early majority when it comes to technology adoption, but they’re more likely to see their companies as being in the late majority or laggards, per results from a Walker Sands study. There appears to be demand for more marketing technology, according to the report, as more than 4 in 10 feel that their existing stack is out-of-date and insufficient. So how does the buying decision take place? Not surprisingly, the search for a new marketing technology most commonly takes place when respondents recognize a need (44% share) or when the current solution isn’t delivering the right results (21%). But marketers typically learn about marketing technologies before they turn to search: 30% said they usually first learn about them from peers or colleagues; 20% first from publications or blogs; and 13% first from search. As for theÂ publications that inform them, Forbes (44%), Wired (37%) and the Wall Street Journal (35%) are the destinations where the largest proportion of respondents read about marketing technology solutions and marketing industry news. When it comes to beginning an online search for a vendor or solution, forget mobile devices. Instead, 91% said they begin their search on a desktop or laptop, with just 6% beginning on a smartphone and 3% on a tablet. And while a greater proportion ofÂ marketers conduct at least some research on smartphones (56%) and tablets (40%), the most time is easily spent on desktops and laptops, with 92% doing most (48%) or all (44%) of their research on those devices. When researching solutions, peer recommendations are easily the most influential source of information, per the report, cited by 63% as being very influential. As such, peers are not only the most likely to be the first source of information about solutions, they’re also the most influential. Following peer recommendations, online reviews (44%) and analyst reports (33%) are the most influential sources of information, indicating a desire for independent content about the solution. Not far behind, though, 29% cite the vendor’s website or blog as being very influential, and vendor content is also cited as being very influential by 29%. As for vendors’ social media accounts? Only 7% see them as being very influential, while almost half say they have no influence at all. The lack of influence attributed to vendors’ social media is supported by data contained in MarketingCharts’ B2B Digital Marketing Insights Report, in which few B2B buyers reported that a company’s social media activity impacts their vendor decision-making process. However, the study also demonstrates that buyers feel that vendors’ social activity can help establish a company’s credibility. Meanwhile, although vendor content falls behind third party independent reviews and recommendations in terms of influence, it does have some influence for about 9 in 10 buyers. When asked what kind of content most influences their technology buying decisions, respondents pointed first to product demos (52%), followed closely by case studies and testimonials (47%). Surprisingly, videos (15%) and webinars (14%) are much further down the list, despite B2B content marketers reporting a sizable degree of success with those content types. There have been differing reports about the role of the salesperson; the Walker Sands study finds that most marketers prefer to first engage with a vendor’s sales representative during the research (59%) stage, as opposed to pre-research (5%) or at decision time (28%). As for the oft-quoted statistics about how far along the decision process buyers are when they first contact a sales rep? This study has its own results: 40% say they are at least 70% of the way to making a decision before engaging a representative, and about two-thirds are at least half-way. When it comes time to make a decision, a plurality (25%) of respondents say that 3 people are typically involved in the decision, though a majority typically have 4 or more involved. This appears to be somewhat influenced by company size, as 42% of marketers from large companies (1,000+ employees) say at least 10 people are involved in the decision. This makes it important to remember that it’s not just the C-suite that influences buying decisions; data in the MarketingCharts report demonstrates that non C-suite employees also have some influence over B2B purchase decisions. Budget is the biggest obstacle to a purchase for each job title, and while difficulty of implementation and internal resistance are the next-largest obstacles for all those beneath the CMO, the CMO’s next biggest obstacle is the inability to find something to meet the company’s needs. Finally, in contrasting the buying behavior of Millennials and Boomers, Walker Sands finds that Millennials are more likely to prefer making decisions with a small group of decision-makers, and are also more likely to rank online reviews as the most influential source of information when searching for marketing technology solutions. 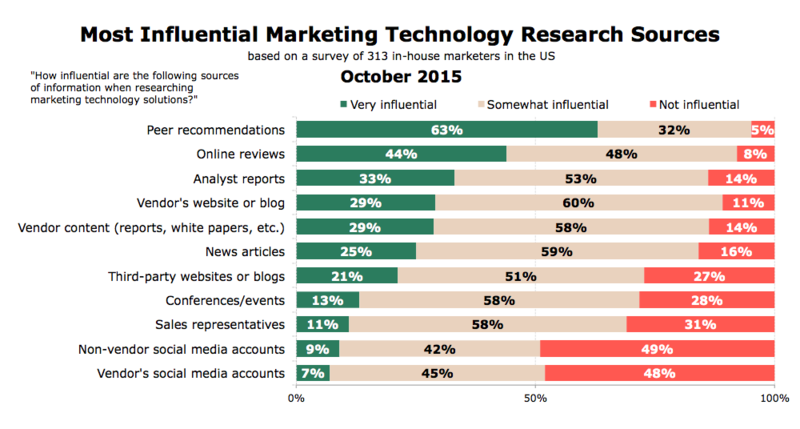 About the Data: The Walker Sands State of Marketing Technology 2016 Study surveyed 313 marketers across the United States on how they make marketing technology purchase decisions. The survey was fielded online between July 1-20, 2015, and respondents were limited to professionals who currently work in the marketing department of a company or organization. The survey has a 5.5% margin of error at a 95% confidence level.